Being back in Houston for the upcoming delivery meant we were able to do Halloween here this year. Last year in Guatemala, DiploTot was an owl. 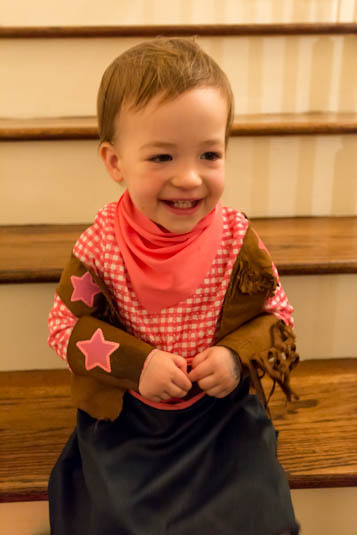 Being that we are back in Texas, it only seemed appropriate that she should be a cowgirl. Here she is finally smiling after being bribed with some fruit treats. She has the requisite pink boots as well that aren’t visible, but it was all we could do to get these photos, so we quit while we were ahead. 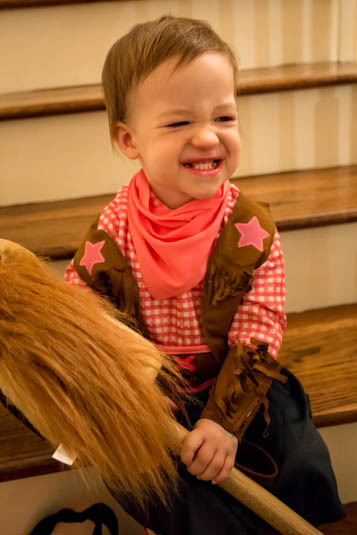 After this we went to a few houses for trick-or-treating, but that was relatively short lived as we probably waited a bit too late to get started.